This beautiful night light is will make a beautiful piece of art for your home. Night light is made from original designs created by an artist and sculptor. Each nite lite is handmade from a formula of resin and marble. This makes the night light safe and durable. The warm eggshell color makes it perfect for any room. Choose from four styles. 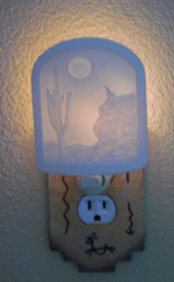 Kokopelli night light (shown above) or Coyote, Eagle or Native design (shown below). Sorry: the only style we currently have in stock is the Kokopelli. Night lights measure approximately 3.75 inches wide x 4.5 inches high. Sorry the Kokopelli nite lite is not available until after the holidays. 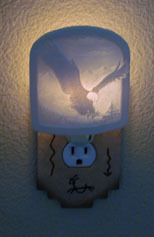 Sorry, the Eagle Night Light is not available at this time. Nights are shown plugged into our southwest switchplates. Reserve your night light today.